Pustulotic arthro-osteitis is a special form of arthropathy associated with the dermal disease pustulosis palmoplantaris. It is generally characterised by more osseous involvement than seen in other forms of SpA. It often involves the anterior chest wall as well as the spine, and changes in other joint regions are rare. Pustulotic arthro-osteitis is sometimes described under the term SAPHO (syndroma acne pustulosis hyperostosis), which encompasses a mixture of various diseases with a tendency to manifest themselves with enlarged bone or joint regions (hyperostosis). The skeletal changes occurring in pustulotic arthro-osteitis predominantly consist of osseous changes in the form of increased density (sclerosis) and sometimes also enlargement of the bone involved (hyperostose). The osseous changes are usually localised adjacent to joint facets, but do not cross the joints in the early stages of the disease. In this aspect, the changes differ from the features of more common forms of SpA. The changes are typically localised to the ileum and present themselves as increased bone density by radiography or CT. During active phases MRI shows oedema and contrast enhancement in addition to the chronic osseous changes. 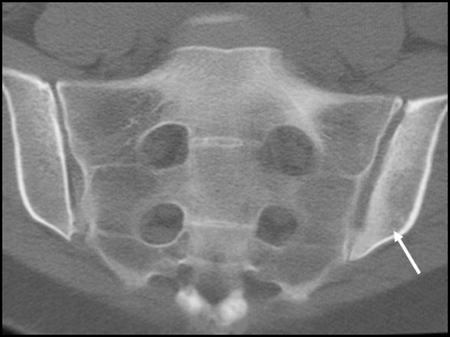 Semi-coronal CT slice shows increased bone density corresponding to the left-sided iliac bone adjacent to the sacroiliac joint (arrow). Semi-coronal post-contrast T1 FS image shows pronounced enhancement in the diseased area as a sign of activity. Moreover, enhancement in the sacrum beneath the vertebral plate at L5/S1 without accompanying changes corresponding to the 5th lumbar vertebra or the disc (arrows). 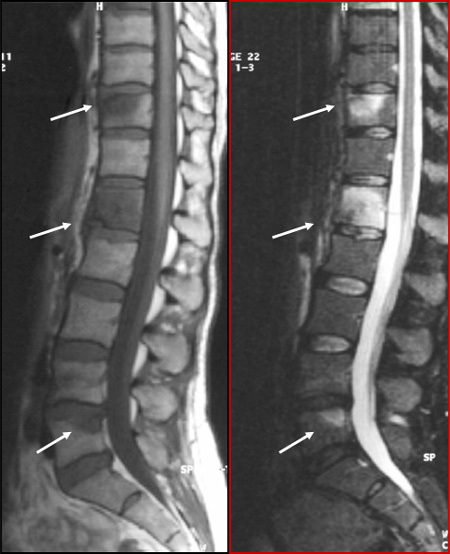 The disease often involves several vertebral bodies, which can be visualised by MRI in the early stage before the occurrence of increased bone density. 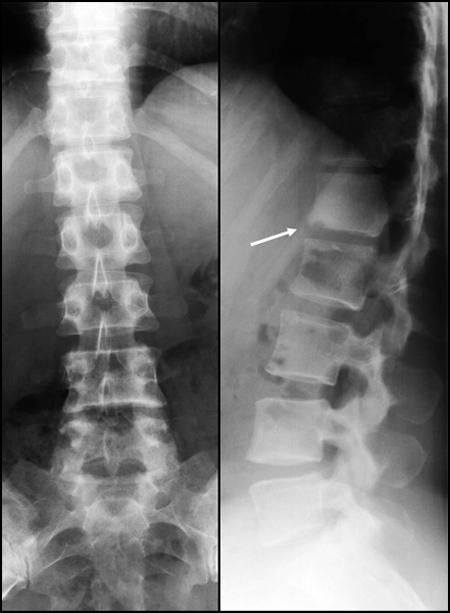 Sagittal T1 and STIR images show osseous oedema in several vertebrae (arrows). There is also a small erosion at the lower vertebral plate of the first lumbar vertebral body. 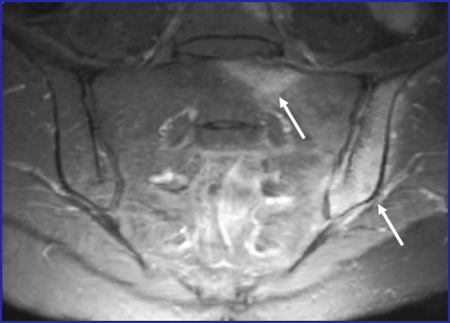 Simultaneous radiography o nlyshows changes in the lower part of the first lumbar vertebral body in the form of increased bone density and the erosion also visualised at MRI (arrow).